Background: Obesity and its co-morbidities become to be one of the most important health care problems. Thailand and other Asian counties are not excluded. Weight loss surgery has been proved as the most effective and sustainable method to obtain long term weight control and to achieve improvement of metabolic disorders. We reviewed outcomes of surgical treatment for morbidly obese in Thai patients in our institute. 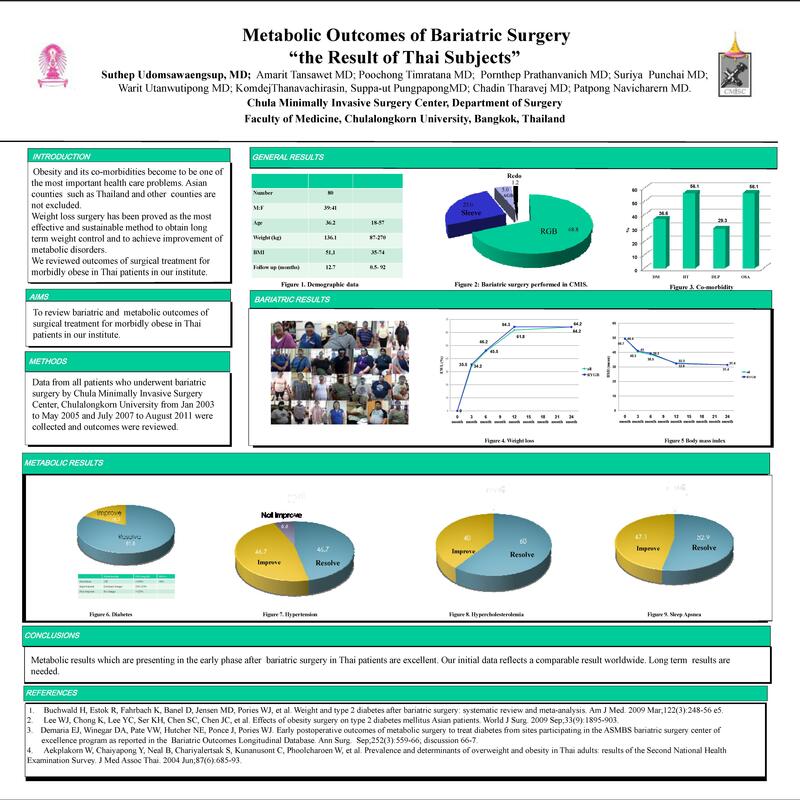 Methods: Data from all patients who underwent bariatric surgery by Chula Minimally Invasive Surgery Center, Chulalongkorn University were collected and outcomes were reviewed. Results: From Jan 2003 to May 2005 and July 2007 to August 2011. Eighty consecutive Thai patients underwent bariatric surgery by Chula Minimally Invasive Surgery Center, Chulalongkorn University. The mean age was 36.2 (18-57) years. Fifty one of 80 (51.3%) were men. The initial BMI was 51.1(35-81.3) kg/m.2 Roux en Y Gastric bypass was the most common procedure (68.8%). In RYGB group showed mean EWL of 64.2% at 2 years. Nineteen (23.8%) were type II diabetic, all of them were getting improvement post operatively; of which, 81.8% were completely resolved and 18.2% were able to decrease dosage of hypoglycemic drugs. Thirty four (42.5%) were hypertensive, 46.7% of them were able to discontinue antihypertensive drugs and 46.7% were decreasing dosage. Twenty one (26.3%) were dyslipidemia; 60% were resolved and 40% were improved. Conclusion: Metabolic results in Thai patients undergoing bariatric surgery are excellent. This initial data from part of Asia reflects a comparable result worldwide.